Joel Simpson, 18, of South Carolina, sent in this one. 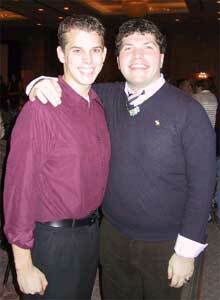 "This is a picture of me (left), a rookie for the Cavaliers, and Ryan Bronner, the age-out color guard captain, at the 2003 Cavaliers awards banquet. Ryan was one of the first Cavaliers I knew and also gave me the best of advice for surviving this upcoming summer, since this is my first season in guard, ever, and how to handle the audition process. This picture was taken after I had told him that his coaching had paid off and I was awarded a spot in the 2004 Cavaliers Color Guard." Thanks Joel! We're running out! Send us more of your Forzato submissions!